The Highway Driving Simulator (HDS) is a high-fidelity, state-of-the-art research tool used in a variety of studies related to roadway safety and operations that are conducted for the Federal Highway Administration and other stakeholders. An upgrade to the motion base from three to six degrees of freedom was recently completed to make the simulated driving experience feel more realistic. This report describes the latest upgrade. It includes a discussion of the reasons for using a driving simulator for highway research and the challenges of conducting meaningful driving simulator research, followed by a description of the motion-base installation, tuning, and validation process of the HDS by Human Factors researchers, simulation experts, and safety specialists. The overall objective of this project was to upgrade the systems in the HDS to improve the simulated driving experience to obtain a more complete driver immersion for the purpose of collecting the most accurate driver reactions to the target studies. This report is of interest to human factors researchers, safety specialists, and engineers who use motion-base driving simulators. Dr. David Yang (HRDS-30) was the Contracting Officer’s Representative for this contract, and Dr. Michelle Arnold (HRDS-30) was the Task Manager. The Highway Driving Simulator (HDS) was recently upgraded to a six-degrees-of-freedom motion-base system. The objective of the upgrade was to enhance the realism of the simulator. A motion-base-tuning process ensured that the new motion-base system enhanced the realism of the simulator. This report describes the tuning of the motion base and adjusting of the simulator system functions in the HDS’s six-degrees-of-freedom motion-base system. The tuned configuration, in conjunction with the other systems, produces an immersive and realistic driving simulation that will support human factors evaluations for highway design. Figure 1. Illustration. The six degrees of freedom with the latest upgrade to the FHWA HDS. Figure 2. Illustration. Components of the FHWA HDS. Figure 3. Diagram. Role of ARCHER software. Figure 4. Diagram. Motion-base-filter algorithms. Table 1. Manufacturer-supplied specifications for the motion base. Table 2. Mean acceleration ratings. Table 3. Mean braking ratings. Table 4. Mean turning ratings. Table 5. Comments on turns that raised concerns. Table 6. Mean slalom ratings. Tests and evaluations of signs, signals, markings, and geometric design. Tests of in-vehicle auditory warnings. Tests of roadway warning devices. Tests of sign and marking visibility. Evaluations of roadway sign and marking colors and shapes. Tests of changeable message sign messaging effects. Studies on the effects of information overload and external distractions. Studies of signs and marking for contraflow lanes. The first published report based on research conducted with that simulator appeared in 1983. (2) The study examined the relationship between the color of the background of stop and yield ahead advance warning signs in work zones and sign detection and recognition distance. The study showed that the yellow background yielded markedly better detection and recognition distance. Since that first study, all but one of the above types of research have been conducted either in FHWA’s first-generation Highway Driving Simulator (HDS) or in subsequent upgraded generations. The first-generation FHWA HDS was quite primitive by today’s standards. As described in a 1986 research report, it consisted of a 1980 midsize car with a projection screen mounted over the hood that afforded a 50-degree horizontal by 40-degree vertical field of view. 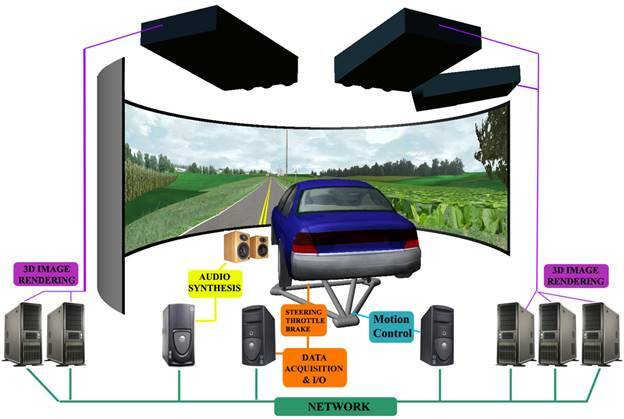 (3) Roadway scenes were projected onto the driver’s flat screen from a 21-inch (53.34 cm) cathode ray tube projector. The simulator was interactive in that the crude visuals responded to driver steering, accelerator, and brake inputs. Crude wind, road, and engine noises were generated. The system had a fixed base (i.e., the car did not move). In the 35 yr since FHWA’s first driving simulator study, the simulator has been upgraded many times. The purpose of this report is to describe one of the latest upgrades: the installation and tuning of a six-degrees-of-freedom motion base. Prior to describing the tuning process, the reasons for using a driving simulator for highway research will be discussed, followed by a discussion of the challenges to successfully conducting meaningful driving simulator research. A discussion of the future directions for driving simulator research follows the description of the motion-base installation and tuning. The types of driving simulator research mentioned in the introduction provide some insight into the highway-related issues that can be addressed in a driving simulator. However, many of those issues could conceivably be addressed using other tools or methods. Laboratory evaluations that do not involve driving simulations can provide valuable data on driver comprehension of signs, markings, geometries, and other traffic control devices (TCDs). However, driver comprehension of a TCD does not assure the desired response. The driving simulator provides a controlled environment in which driving responses to TCDs can be observed without safety risks in a short amount of time and potential confounding factors can be precluded. Closed-course TCD evaluations can provide valuable information about detection and legibility distance but, again, are not ideal for observing driver behaviors that result from detection and comprehension. Experimentation in the field provides the most valid method for assessing TCD effectiveness but has several drawbacks. One of these drawbacks is that it may take several years to collect and evaluate safety and operational effects, during which time other changes to the roadway environment may obscure the effects of the TCD of interest, such as traffic volumes, the mix of vehicles and drivers, and other TCDs may change. FHWA has conducted several experiments that could not be accomplished in the field because they involved the testing of potential crash warning systems wherein the metric of interest was the proportion of crashes avoided. (4-6) In addition, the driver demographics (e.g., age, gender, and driving experience) are readily available, which is generally not the case with field experimentation. Also, the participants in driving simulations can be debriefed so that researchers can ask questions about why the participants responded in the way they did. Finally, driving simulators can be used to evaluate new technologies, such as vehicle-to-vehicle- and vehicle-to-infrastructure-based warnings, where the technology is not yet mature enough for field evaluations. One of the more obvious advantages is that a driving simulator does not expose participants to danger. Traffic accidents are always a potential danger in field studies, especially when running hundreds of participants; however, there are no accidents in the simulator. Another advantage is that unique and/or new roadways in the conceptual phase can be tested without the expense of an actual roadway. A good example of this is the Diverging Diamond Interchange (DDI), which was successfully tested in the HDS in 2004, before any were built in the United States. This concept was simulated, studied, verified to be operationally sound, and then implemented. As of today, more than 75 DDIs are in successful operation in the United States. Another advantage of a driving simulator is the level of pure repeatability. The same scenario can be run for multiple participants, thus eliminating outside environmental conditions and distractions that can occur in field studies. The correlation between multiple participants and resultant collected data is highly focused on the exact stimuli being studied. Although driving simulators provide a safe and controlled environment for testing, they are not without challenges that can, if not adequately addressed, lead to invalid findings or misleading conclusions. In this section, some of these challenges are identified. Simulator sickness has been a challenge to simulator research from its earliest days. (7) It is believed to be caused by discrepancies between simulated visual-motion stimuli and motions sensed via the participant’s vestibular system. (8) To eliminate simulator sickness, the visual system would need to match the real-world visual aspects of driving, and the motion system would need to match the real-world experience as well. In nine FHWA driving simulator studies conducted between 2002 and 2014, the average participant dropout rate due to sickness symptoms was 9.3 percent. However, the rate was not consistent across studies. Two of the nine studies had no dropouts. The median rate across the nine studies was 8 percent. (9) The studies with low dropout rates were characterized by few turns or stops and infrequent changes in speed. Those studies with high dropout rates had extensive turning or frequent braking to a full stop. It should be noted that simulator sickness is a form of motion sickness linked to interaction with a simulated environment. It can be caused, for example, by discrepancies between the simulated motion in a simulator and the user’s perception or expectation of motion. Participants are first analytically evaluated prior to simulator exposure, and participants perform a test drive to further confirm their ability to participate in the study. While current technologies are getting better at this synchronization, they are not perfect. The HDS’s visual system updates 60 times per second. Before the system can update the visuals in response to a driver input to the steering wheel, accelerator, or braking system, the input is fed to a computer hosting a vehicle dynamics model, which then calculates heading, acceleration, and braking. That model computes an appropriate vehicle response. That response is then transmitted to a network of computers that relates the vehicle motions to a three-dimensional (3D) model of the world and updates the visual projections as appropriate. The vehicle dynamics model outputs also go to a computer that, with the latest simulator upgrade, controls the movement of the six-degrees-of-freedom motion base. The motion base is described in greater detail in a later section, FHWA HDS Motion-Base Upgrade, Simulator System Descriptions. The motion base produces the following two basic movements: (1) linear accelerations defined by small longitudinal (surge), lateral (sway), and horizontal (heave) directions of movements and (2) motion tilt (also called tilt coordination), which includes roll, pitch, and yaw. The six degrees of freedom are illustrated in figure 1. The first motion type, linear accelerations, generally comes close to what a typical vehicle would produce when turning, accelerating, or braking, as calculated by the vehicle dynamics model. This kind of motion is important for the onset cues of motion because small linear accelerations tend to be strongly felt. As long as the lags between driver inputs and motion-base responses are small, these should not induce motion sickness. As would be experienced in the real world, when the car dips or sways to produce body lean, the horizon on the screen remains stationary to the driver. For tilt coordination to be effective, the driver should not be able to detect the tilt itself. Rather, the tilt should induce the sensation of acceleration. Because the HDS has a fixed screen and projectors that do not move during tilt coordination, the visuals on the screen must move in coordination with the motion base. The requirement to adjust the visuals to match the tilt coordination makes the synchronization of the visuals with the motion particularly critical. The vehicle dynamics algorithms, visual system control (Advanced Rendering Cluster for Highway Experimental Research (ARCHER)), and tuned six-degrees-of-freedom motion base perform this synchronization to the maximum extent currently possible. When tilt coordination is used to enhance sensations of acceleration, the tilt is an intentional induction of misperception. Tilt coordination may have two components: (1) an exaggerated onset component to simulate the beginning (or end) of acceleration and (2) a sustained component to simulate continued constant acceleration. The onset component must eventually be reversed (i.e., the motion system needs to return to the idle point so that the next motion requiring an aggressive onset cue is possible. This process of returning the motion base toward its center idle point is called “washout.”(13) If the washout occurs too quickly, the driver may perceive it as acceleration in the opposite direction. Such misperceptions tend to reduce the realism that the motion base is intended to enhance and potentially increase the probability of simulator sickness. The resolution of the simulator’s 3D visual scene has increased greatly over the years but still does not provide 20/20 visual acuity to the driver. Many of the studies conducted in HDS focus on driver responses to signs and markings. When the simulator cannot display signs or markings that are readable at the same distances they would be readable in the real world, drivers have less time to respond to the signs or markings than they would on a real-world roadway. Having less time to respond can result in behavioral responses that do not reflect real-world performance. In summary, the HDS can be a useful tool for conducting driver behavioral studies if care is taken to be cognizant of the challenges and pitfalls of driving simulation. Steps must be taken to minimize simulator sickness. Lags between user control inputs and vehicle responses need to be similar to those characteristic of passenger cars. Lags between the motion system and the visual system need to be small. Washout needs to be imperceptible. For TCD studies, legibility distances need to approximate those in the real world. Previously, the FHWA HDS had a crude three-degrees-of-freedom motion base installed in 1999. By 2013, that motion base was malfunctioning. To retain the motion-base capability, it was decided to replace the old motion base with a more robust, state-of-the-art six-degrees-of-freedom system. It was hoped that the incidence of motion sickness would be reduced by minimizing the differences between visual, vestibular, and proprioceptive motion cues in addition to replacing the existing motion base. Second, it was felt that a motion-base system greatly enhances the realism and validity during driving simulations. For instance, it adds stimulus/sensory input, and maneuvers, such as braking, become more realistic because the car imparts physical forces on the driver. A motion base also supports gaze stability for the driver. Gaze stability is the point on the screen on which the driver focuses while making a maneuver. A correctly tuned motion base ensures synchronization between the combined visual motion vector and the anticipated motion forces during maneuvering. This can be especially important during turns, which, when in conflict, can lead to simulator sickness. The following section describes the HDS as it was configured for the motion-base tuning and validation. FHWA’s HDS consisted of a small compact vehicle body mounted on a six-degrees-of-freedom motion base. The manufacturer-supplied specifications for the motion base are shown in table 1. The actual limits for each degree of freedom are controlled by the motion-base software. In general, after tuning the motion base, these limits are well below the maximum limits of table 1. The controls and displays within the simulator cab were those of the standard small compact vehicle except that the steering wheel was replaced with a gaming-type, electric-force feedback system. Accelerator pedal resistance was spring loaded, and brake pedal resistance was hydraulic. As depicted in figure 2, the cab and motion base sat within a concave cylindrical screen with a vertical radius of 107 inches (2.7 m). The driver’s eyepoint directly forward was set 8 inches (20 cm) back from the center of the cylinder. Images were projected onto the screen by three high-end, simulator-based liquid crystal on silicon projectors, each projecting 4,096 pixels horizontally and 2,400 pixels vertically. Edge blending was used to make a seamless 200-degree horizontal field of view. The vertical field of view was nominally 40 degrees, although to accommodate the motion base, the driver’s view forward was never more than about 20 degrees, with the remainder of the screen obscured either by the vehicle roof or hood. The FHWA HDS is composed of computers that achieve multiple functions or roles in the ARCHERsoftware system. (14) The ARCHER software is able to run roles across multiple computers in a cluster computing configuration to achieve the driving simulation capability. Between 1 and 15 computers can be used to drive a simulation scenario, depending on the configuration defined. The motion base is one part of the driving simulator system. 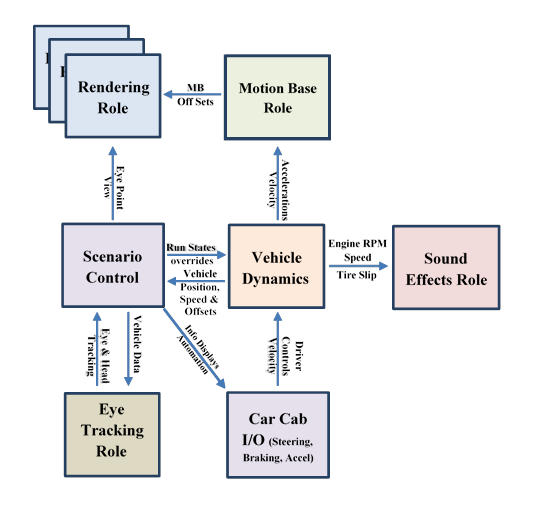 A visual 3D rendering system, the motion base and audio synthesis (engine, road, and wind noise), and vibrations are all components of the system. All of these systems are synchronized to produce the sensation of motion, each with its own unique requirements and limitations available for implementing the simulation. The vehicle’s simulated motion is first defined by what the driver does with the main vehicle controls in the car cab. The steering, accelerator and brake pedals are the primary inputs for the vehicle dynamics algorithms, which are used to update the vehicle at every simulation step. Each of these controls provides force feedback based on the driver’s movements within the car and the simulated motion taking place. For example, the steering may pull left when the driver is steering hard to the right. The vehicle dynamics code calculates this actual force on the steering and brake and accelerator pedals; however, simulated devices must limit actual forces to those safe to use in the simulator. The car cab control inputs are used in conjunction with other scenario environmental attributes, such as the terrain elevation and frictional coefficients, to calculate the positional and orientational updates at a refresh rate consistent with a high precision of control requiring fast update rates for visual and control inputs with no lag. The resulting vehicle dynamics solution defines the vehicle’s new position calculated for each visual refresh step (rendering) and is used for the resulting offsets needed for the fixed projector system. The images generated on the screens and the images produced for the rearview mirror are defined as the “simulator rendering system.” Because of limitations in rendering devices, such as the projectors used by the HDS, the visual system can refresh at 60 frames per second, which is generally considered a high refresh rate. The rendering system generates all of the images based on the driver’s eyepoint. The driver’s eyepoint is defined as the location of the driver’s eyes (with vehicle position updates calculated by the vehicle dynamics system) coupled with the motion base offsets required for the fixed projector/screen system in the HDS. The feedback mechanism of the engine, wind, and tire noise also has an effect on the driver. Sound is both an expected and helpful cue in determining vehicle performance and control. The vehicle sound is tightly synchronized to the real-time output values of the vehicle dynamics and are driven by the vehicle’s speed and the engine’s revolutions per minute value. Motion is the most difficult of the sensory cues to emulate actual forces and to synchronize with the other sensory cues used for driving. The cause of the difficulty is due, in part, by actual forces of motion that cannot be generated except at a fraction of the magnitude and duration of the real forces of driving. The vehicle dynamics model converts control inputs to acceleration and position outputs based on settings for such things as horsepower, tire friction, roll resistance, inertia, and vehicle weight, among others. These values are used as linear and rotational velocities and accelerations. The actual usage of the motion cueing is based on a long history of using simulation-motion-base systems (both flight and driving), and this model is specific to the motion-base design type and limitations. The HDS motion base is a Moog™ hexapod design with linear motion limits about 8 inches in surge, sway, and heave as shown in table 1. The rotational limits are around 15-18 degrees. The Moog™ motion platform has the capability to give fast response (higher acceleration) linear and rotational cues with short durations of a few seconds. One disadvantage of maximizing the motion-base movement is the requirement to reset to a neutral position to reuse the linear or rotational acceleration forces. The method of resetting is called “washout,” where the motion base is slowly moved back to center to enable its use for a subsequent maneuvers and the driver does not feel the reset to the neutral position. The diagram in figure 3 illustrates the main roles in the ARCHER software and the kind of data passed between these roles to function. MB = motion base; RPM = rotations per minute; I/O = input/output. One of the first steps during the tuning process is to define the basic types of vehicle maneuvers based on common experiments that are conducted using the HDS. For example, a motion base has a limited range of motion and a limited amount of acceleration that can be achieved. The linear motion is limited in surge (forward and back), sway (left and right), and heave (up and down), which means that any moderate level of acceleration can only be sustained for less than a few seconds at most. Because of these limitations, it is important to define how the available motion will produce the effect for each given maneuver. Rural curve handling—vertical and horizontal curves. Intersection studies with town/city driving—many stops and starts. Highway driving—lane changes and emergency stops may be required. Signage studies—generally have very little maneuvering. The maneuvers were modeled based on the descriptions provided above in order to recreate the maneuver and accelerations produced in both the simulator and the real world. While the real world cannot be fully reproduced in magnitude or duration, understanding the basis for an acceleration profile is useful in analyzing a driver’s expected acceleration. In addition, the same path can be used in the simulated environment and a test track by setting up a cone setup map for each maneuver and then creating a simulated scenario using this same setup map by creating a 3D model of the geometric path. A field research vehicle (FRV), an instrumented sport utility vehicle capable of collecting data such as vehicle speed, steering angle, pedal positions, accelerations, Global Positioning System data, and other measures, was used to collect data and test proposed roadway layouts. This roadway layout would serve as the baseline for tuning the simulator. The FRV was driven on a test track at the Federal Law Enforcement Training Center in Cheltenham, MD. After screening out unrealistic layouts (e.g., layouts where speed was too fast or turning radius was too sharp), the remaining layouts were then driven at the test track then later modeled and programmed into the simulator and used for perception testing of the motion base. The maneuvers from the test track were driven in the simulator, and comparisons were done using an accelerometer on the vehicle cab. The measurements obtained from driving at the test track were used in the motion-base-tuning process to better match the accelerations (timing and direction) of the motion in the driving simulator. After the simulation scenarios (acceleration, braking, turning, and slalom maneuvers) were created from the down selected layouts, the initial simulator testing portion of the tuning process for the motion-base system began. This informal evaluation was performed by engineers and researchers who maintain and use the HDS with the assistance of a subject matter expert (SME). Individuals drove the simulated scenarios and provided informal feedback regarding steering, acceleration, braking, and turning for each scenario. If a member responded with negative feedback, the research team continued to seek a combination of tuning settings that was acceptable to all. For instance, when braking, the motion system tilts the car forward to simulate the feelings produced when a car slows, but inertia causes the driver’s body to attempt to maintain the current velocity. If the forward tilt is perceived as something other than a typical deceleration, that perception is a false cue. In extreme cases, a false deceleration cue can be perceived as spinning or sliding (as if on ice) rather than as a change in speed. This was resolved by filtering out small parameter changes to the motion base after the visual scene indicated a stop in motion. The configuration of the motion base includes three modes with dozens of variable parameters. The modes include the amount of washout (none, medium, and full) that occurs in the movement motion base. An example of a parameter for a mode is a variable that specifies the allowable distance that the motion base can travel in the X, Y, or Z direction. Because of the large number of possible combinations of variable settings, an SME with experience in motion-base driving simulators, equation of motion, and vehicle dynamics down selected the initial settings by tuning the simulator to a baseline level. The SME was able to reduce the number of settings to be considered during tuning to one mode of operation and 18 parameters of most significance. For this particular application, the mode selected was for full washout capability. Angle Rate Limit—Pitch Rate Upper Limit. Angle Rate Limit—Pitch Rate Lower Limit. Angle Limits—Pitch Angle Upper Limit. Angle Limits—Pitch Angle Lower Limit. Angle Limits—Yaw Angle Lower Limit. Over Tilt—Maximum Specific Force (X). Over Tilt Flags—X Over Tilt. Over Tilt Flags—Y Over Tilt. Tilt Rate Limit X—Maximum Tilt Rate Longitudinal. Tilt Rate Limit Y—Maximum Tilt Rate Lateral. Over Tilt Scale Factor X—OverTilt Ideal Scale Factor. Over Tilt Scale Factor Y—OverTilt Ideal Scale Factor. The SME provided a significant insight into both the vehicle dynamics algorithms and motion-base algorithms that greatly shortened the tuning process and enhanced the understanding of the overarching concepts. One concept in calibrating a motion base is to ensure there exists the correct mathematical models for driving and to have the variables set correctly relating to the center of rotation and motion compared to the head’s center offsets for the driver. The physical positioning of a driver in the environment is modeled correctly, and the physical relationships for the car size/height must match the simulated vehicle for both vehicle dynamic algorithms and for the visual 3D rendering algorithms. Even small-value deviations can throw off the feeling of motion because a driver may receive reverse cues when initial rotations start with an incorrect offset. The SME reviewed the setups and made slight adjustments by verifying the mathematical model methods that were being used to produce the motion-base movement. Another concept that the SME discussed was the model of processing and filtering the input values of linear and rotation velocities and accelerations shown in figure 4. 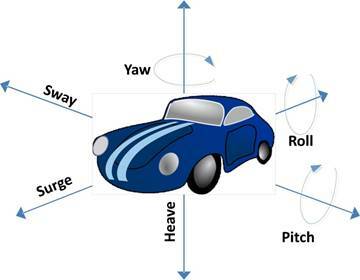 The input values for the forces are generated by the vehicle dynamics model and represent the actual forces generated by the driver’s maneuvering behavior. These values are treated in two different ways to use both short-term onset cue accelerations and use motion tilt for generating longer-term sustained forces. The initial values are filtered and limited for safety and for limits required for motion-base clearances. It is convenient to consider orientation calculations being mostly used for the sustained “motion tilt” forces and the linear motion used for onset cues. There are several dozen parameters that are used to tune and vary the response of motion. Many of these values are coefficients, which vary the exact response on a given axis of movement. Some of these values affect the filtering by using low- or high-pass filters to tune out specific frequency of motion. The SME’s knowledge of modifying combinations of specific parameters and the changes that bring about feelings of motion were utilized in this step and continued to move the tuning process forward toward participant drivers evaluating the actual perception. Following the tuning process, Federal staff and contractors at the FHWA Turner-Fairbank Highway Research Center were recruited to drive the simulator and rate the realism of the simulation drive. These participants were also asked about any false motion cues they may have felt. The validation examined the following three aspects of driving dynamics: acceleration and braking, turning, and negotiating slalom. Each of the three driving dynamics elements were examined separately. There were nine drivers for most of the testing: two were female and seven were male. All drivers worked at the research center as either Federal employees or contractors. While accelerating or maintaining the instructed speed, did you ever feel like you were decelerating? Did you feel as though you were being tilted up or down? If the participant answered “yes” to question 2, they were asked to rate how noticeable the feeling of deceleration was. Accelerate normally to 10 mi/h (16 km/h), and maintain that speed. Accelerate normally to 30 mi/h (48 km/h), and maintain that speed. Accelerate rapidly to 40 mi/h (64 km/h), and maintain that speed. Accelerate rapidly to 60 mi/h (96 km/h), and maintain that speed. While braking or after stopping, did you ever feel like you were accelerating? Overall, how acceptable was the motion cueing? From 10 mi/h (16 km/h), brake normally. From 30 mi/h (48 km/h), brake normally. From 30 mi/h (48 km/h), brake hard. From 40 mi/h (64 km/h), brake hard. From 60 mi/h (96 km/h), brake normally. For both acceleration and braking, participants were also provided an opportunity to add additional comments about their experience. Turn perception was evaluated for the following two turn radii: 40 ft (12 m) and 300 ft (91 m). For the 40-ft (12-m) radius, the deflection angle was 90 degrees. For the 300-ft (91-m) radius, the deflection angle was 60 degrees. One speed—25 mi/h (40 km/h)—was used with the 300-ft (91-m) radius. Three speeds—5, 10, and 15 mi/h (8, 16, and 24 km/h)—were used with the 40-ft (12-m) radius. For most of the turns, 12 observers participated. Each of the curves was indicated in the simulated scene by pairs or traffic cones that described a 12-ft (3.7-m) lane. The mean ratings for the realism and acceptability of the feel of longitudinal acceleration are shown in table 2. These ratings were interpreted to mean that the motion-base tuning, with respect to acceleration in a straight path, was adequate and did not need to be adjusted further before continuing with the next experiment, which called for freeway driving with no curves or stops. Over 48 trials, there were 2 reports that a participant perceived that the car was decelerating when the accelerator was released to maintain the instructed speed. There were a number of reports that tilting was perceived; however, further questioning revealed that this tilting was not a false cue caused by tilt coordination but rather the normal movement of the cab at the onset of acceleration and again when the acceleration ended. 1 mi/h = 1.61 km/h. The mean ratings for the realism and acceptability of the feel of longitudinal deceleration are shown in table 3. These ratings were also interpreted to mean that the motion system settings were adequate to proceed with the next study, in which there was only one planned stopping event. The mean ratings for the realism and acceptability of the feel of turns are shown in table 4. Although these ratings are only slightly lower than the ratings for acceleration and braking, they were not deemed adequate because of the number of reports of false cues and because of a few very low ratings that skewed the results. Many of the comments, shown in table 5, refer to feeling like being on ice or the back end is skidding out. Several of these comments came on trials where the participant had answered “no” to the question “did you ever feel like you were slipping, sliding, or moving in the wrong direction?” Because the comments describe feelings this question was intended to identify, it appears that the questionnaire needs refinement. Several of the comments indicate that the false motion cues occurred when the participant was coming out of the curve and braking. This may suggest that the motion cues within the turn are adequate and that it is the washout occurring during recovery from the turn that is problematic. 1 ft = 0.3 m; 1 mi/h = 1.61 km/h. Feels weird at this speed. Back end was sliding like on ice. Slipping-scene was moving in opposite direction of turning; like on ice. Going into curve felt a little slip in the middle of the curve; subject was braking a little in curve. Felt funny straightening out after turn. Felt weird when he over steered and had to correct. Feels better at higher speeds. Stopped because of simulator sickness. Tilt came at the end when coming out of last cone. Felt discomfort after last turn. Felt tilt when had to over steer to correct. Back end felt like it was on ice; seemed to happen on oversteering and tried to correct. Slip felt at the beginning of curve. Feeling a little sick when braking. Tilt felt weird; slide in the direction of turning. Felt unnatural tilt when letting off the accelerator. Felt like cannot control the vehicle. Felt like the skid was on the back end like fish tailing. Stopping did not feel right. Unnatural tilt down when letting off the accelerator. Said feeling drifting did not get that feeling at 15 mi/h. Feels like the car needs more body roll. The mean ratings for the realism and acceptability of the feel of turns are shown in table 6. The ratings for realism were comparable to those for acceleration. Feelings of comfort and controllability, which were not asked during the other motion cueing tests, were quite high. It was decided that the motion-cueing settings for slalom type maneuvers (e.g., lane changes and merges) were satisfactory. The FHWA HDS motion-base system is tuned for the performance of experiments with specific roadway and maneuver types that involve driving on straight roads and require lane changes and merges. These were identified as required for upcoming human factors research. The longitudinal tuning validation, to date, only involved single acceleration and deceleration cycles (i.e., accelerate to a given speed, maintain that speed, and then come to a complete stop). For experiments that involve many start-stop cycles or many changes in speed, validation and minor adjustments, if needed, should be undertaken to verify that there are no buildups in undesirable perceptions in these situations. Such buildups might occur, for instance, if the washout algorithms fall behind. Such testing will only be necessary if an experiment requires frequent start-stop or change of speed cycles. Roberts, K.M. (1980). “The FHWA Highway Driving Simulator.” Public Roads, 44, pp. 97-102, Federal Highway Administration, Washington, DC. Lum, H.S., Roberts, K.M., Dimarco, R.J., and Allen, R.W. (1983). “A Highway Simulator Analysis of Background Colors for Advance Warning Signs.” Public Roads, 47, pp. 89-96, Federal Highway Administration, Washington, DC. Alicandri, E., Roberts, K., and Walker, J. (1986). A Validation Study of the Dot/FHWA Highway Simulator (Hysim), Report No. FHWA-RD-86-067, Federal Highway Administration, Washington, DC. Inman, V.W. and Davis, G.W. (2009). The Effects of in-Vehicle and Infrastructure Based Collision Warnings to Non-Violating Vehicles at Signalized Intersections, Report No. FHWA-HRT-09-049, Federal Highway Administration, Washington, DC. Inman, V.W., Jackson, S., and Philips, B.H. (2016). Cooperative Adaptive Cruise Control Human Factors Study: Experiment 1—Workload, Distraction, Arousal, and Trust, Report No. FHWA-HRT-16-056, Federal Highway Administration, Washington, DC. Inman, V.W. and Philips, B.H. (2015). “Assessing the Distraction Potential of Changeable Highway Message Signs.” 8th International Driving Symposium on Human Factors in Driver Assessment, Training and Vehicle Design. University of Iowa, Iowa City, IA. Reason, J.T. and Diaz, E. (1971). Simulator Sickness in Passive Observers. Report No. FPRC/1310, Ministry of Defence (Air Force Department), distributed by the National Technical Informational Service, U.S. Department of Commerce, Washington, DC. Available online: http://www.dtic.mil/dtic/tr/fulltext/u2/753560.pdf, last accessed October 20, 2017. Reason, J.T. and Brand, J.J. (1975). Motion Sickness. Academic Press, London, UK. Balk, S.A., Bertola, A., and Inman, V.W. (2013). “Simulator Sickness Questionnaire: Twenty Years Later.” Proceedings of the 7th International Driving Symposium on Human Factors in Driver Assessment, Training, and Vehicle Design, pp. 257-263, Bolton Landing, NY. Johnson, D.M. (2005). Introduction to and Review of Simulator Sickness Research, Research Report 1832, U.S. Army Research Institute for the Behavioral and Social Sciences, Fort Belvoir, VA.
Kennedy, R.S., Fowlkes, J.E., Berbaum, K.S., and Lilienthal, M.G. (1992). “Use of a Motion Sickness History Questionnaire for Prediction of Simulator Sickness.” Aviation, Space, and Environmental Medicine, 63, pp. 588-593, Aerospace Medical Association, Alexandria, VA.
Kennedy, R.S., Lane, N.E., Berbaum, K.S., and Lilienthal, M.G. (1993). “Simulator Sickness Questionnaire: An Enhanced Method for Quantifying Simulator Sickness.” The International Journal of Aviation Psychology, 3, pp. 203-220, Taylor and Francis Group, London, UK. Jamson, A.H.J. (2010). Motion Cueing in Driving Simulators for Research Applications. University of Leeds, Leeds, UK. Williams, J.R., Chou, T.C., and Wallick, B. L. (2005). “Advanced Rendering Cluster for Highway Experimental Research (ARCHER),” Proceedings of the 2005 Driving Simulation Conference North America, Orlando, FL.